Once again, the anti-TMT, anti-GMO, anti-everything folks are going to protest yet again. This time, their groups have united to “protect” Hawaii. 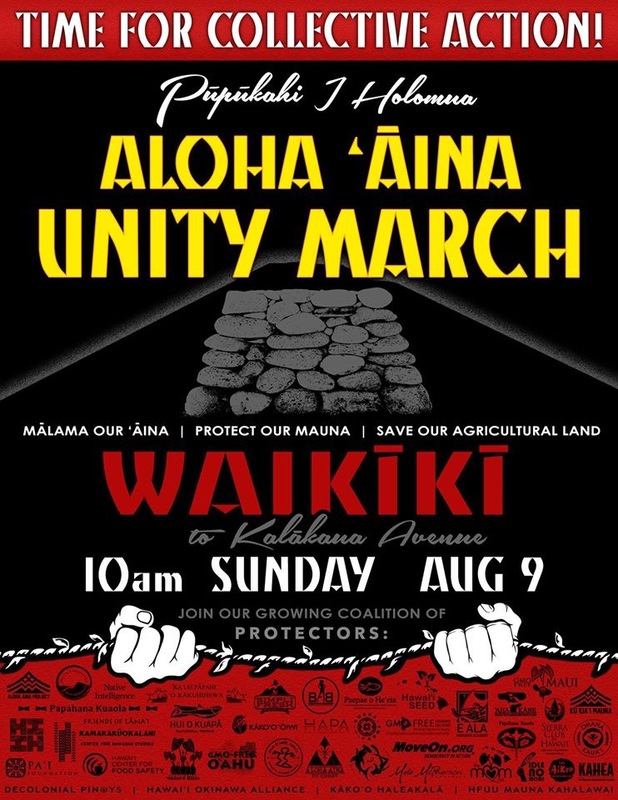 They have decided to “malama the aina” and “protect the mauna” and save agricultural lands. These folks can stay really busy doing all three. I can’t help but remember the pleading cries of mothers and others who testified at multiple hearings over the last several years. They accused the seed farms and farmers of “poisoning” their children and making them sick. They pleaded with the legislators to protect them by enacting disclosure laws, buffer zones, and bans of biotech farms. Many of these folks still claim that they are sick and attribute it to farms despite the fact that the evidence doesn’t support it. The campaign by the anti-groups indeed were successful even without data. If the “protectors” really care about these folks, why are they so busy fundraising for plane tickets and bail money? I’ve seen so many gofundme accounts set up to raise money but not a single dime is going towards the alleged sicknesses that they claim of over and over. They aren’t even funding testing of people either to confirm the source of their health claims. This activism also has its roots in anti-corporate attitudes but they actively make use of those services only provided by the very people they distrust. The activists decry money and greed but then go out and seek money themselves to fund their cause. The activists talk about not wanting outside influences having a say in Hawaii but then join with the Washington, DC based Center for Food Safety group. This group is nothing close to being local at all and has created more wasting of our resources in the name of the malama the aina battle cries. They can fund plane tickets but sure can’t pay back the counties for the costs of court proceedings on badly written laws. Can no one see the inconsistencies of these groups’ messages here? They talk about this concept of “malama,” which means to care but then their actions show the complete opposite! Imagine how much jet fuel and gas is used to bring people to Waikiki for a day of protest. Couldn’t that time and money be better spent by cleaning a beach or helping the homeless? 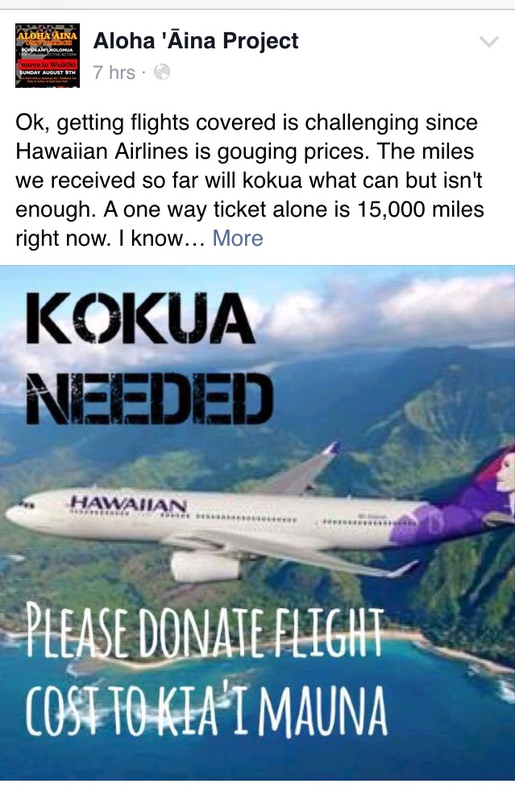 If they want to keep the Mauna sacred, how about throwing the bail money and plane ticket fares towards the education fund instead? Replace what you plan to take away. Create a realistic business plan to help stimulate the economy there with all the opportunities that will be lost. The thousands of dollars used could feed the hungry or buy school books for those needy schools. Last year, a Hawaiian civic group raised money and used it to purchase school planners for my daughter’s 4th grade class. That indeed is a worthwhile cause to help educate children and helps the schools out so much. 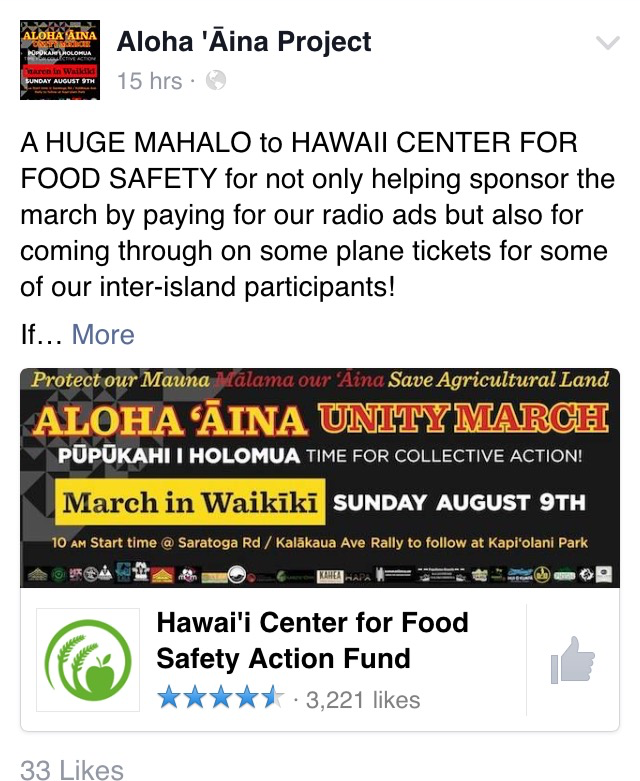 Why aren’t these groups marching to raise funds for those underserved areas on the Big Island? Where’s the giving spirit for the keiki? Teach them how to care for the aina with education and not transient protests. If people are really sick from farms, stop paying Vandana Shiva $40k per talk or ask her to donate it to care for these illnesses. The Center for Food Safety paid a nice sum of money for the misinformation manual they sent out but didn’t donate anything back to the county for any court costs. If they care so much for people, they’d spend our resources wisely. Our leader in Washington can’t even grasp the technology being adopted to help farmers grow food. 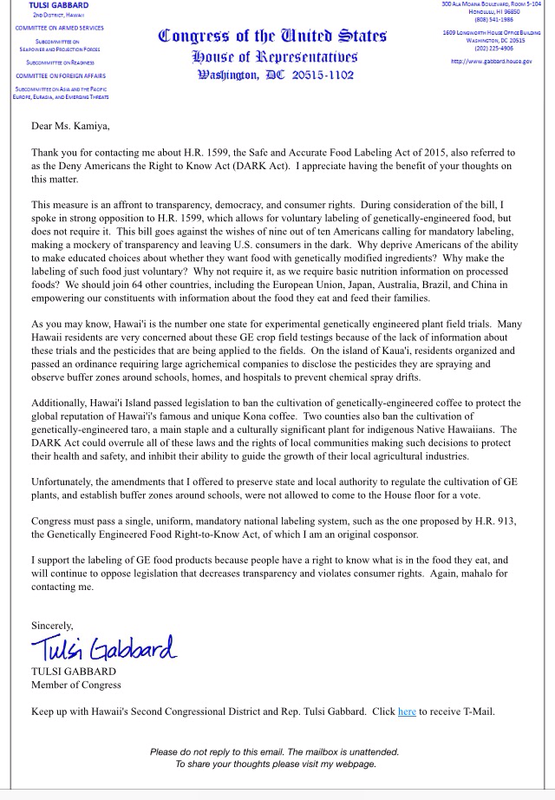 Representative Gabbard doesn’t even realize that by bring anti-GMO means she wants farmers around the world to use old, more toxic crop protection products. She actually is supporting the pesticide companies in developing countries by blocking the adoption of biotech crops as they are separate entities there from the agribusiness companies. Nor does she even bother to tell her constituents the real name of the law or disclose her political funding from the organic industry. She fails to educate others that the regulation around GE crops was in the federal level after 3 county laws were invalidated. Like former State Representative Jessica Wooley, who said there were no regulations on biotech crops, Representative Gabbard also has a hard time with the truth. So once again, the battle cries will start up in Waikiki, the center of the Hawaii they don’t want. Little do they realize that by blocking farms, the land will be paved over and forever changed. By blocking a telescope, they send a message to the youth that you can’t come back to Hawaii to pursue a careers in science and technology because the loudest minority will squash your dreams. Our leaders too can’t see the unintended consequences of caving to all of their demands. As a parent, I don’t give in to my kids’ hissy fits. By giving in to these fits, it only encourages more of it and encourages bad behavior. Kids are prone to bad behavior and have to learn what is and isn’t appropriate. The issues in Hawaii must be dealt with using a realistic vision and high expectations. Using emotions to guide policy harms all of us and lowers the expectations. It’s time for our leaders to demand this of those who want to be an integral part of policymaking. If our leaders don’t stick to that vision, we stand to all lose. My kids will never be able to have that bright future in Hawaii if we can’t even have leaders leading us on that path. I did notice that they used the Hawaiian proverb, “Pupukahi I Holomua.” It literally means to move together in one direction. These groups are moving together backwards and not even making an attempt to work with anyone else in any issue which is clear. It’s about what they want and not about working with anyone else. They refuse to come to the table unless they get exactly what they want. I want our leaders to stick with a vision to make Hawaii better and be brave to make hard decisions in the best interest of everyone. Listening to the squeakiest wheel is distracting us from becoming a better place. We need those leaders now to stand up for our island state if we want a real future for our kids. I’m a mom and that’s what I want. Who’s listening to me? This entry was posted in A Mom's View, The Anti-Science Debacle. Bookmark the permalink. White transplants be like, “It’s our kuleana to malama the aina for the keiki and kupuna with akamai hale aloha mahalo ohana poi!” They use Hawaiian words almost randomly to create fake credibility, to sound like they’re Hawaiian. If I was Hawaiian, I would be offended by this co-opting of the Hawaiian culture for political gain. It’s too bad the Hawaiians don’t see this either. That’s the sad part. The problem stems from the absence of bioethics laws concerning the indigenous people’s rights to their indigenous culture. If the profit from indigenous culture more politically correctly inures to the indigenous population, we probably wouldn’t have the social problems with them today. In fact, in general, that population may have become the upper wealth echelon of the islands. There are a number of things that are disturbing about Tulsi Gabbard’s letter to you Joni. Since when did China become the paradigm of a safe food supply? Their farmers can use whatever pesticide they want to without any governmental oversight whatsoever! They can label food as organic when it is not. Remember the California style organic frozen vegetable stir fry “medley” sold in Whole Foods before the scam was revealed as false? That was food grown in China without any mechanism to determine and certify what is organic and what is not. They just made it up! The other issue I have with her letter is one that keeps coming up time and time again and for which you would think critically thinking people would know better. And that is that GMO be listed as an ingredient! Since when is it an ingredient? It is a process. If we start requiring that foods be labeled by the process under which they were grown or derived then we will have very little that is left to choose from. Would tomato varieties that were developed as a result of irradiation have to be labeled “grown from irradiated seeds from some point in its development”? Or hybrid corn labeled as “derived from highly unnatural inbred corn parents”? I heard a story on HPR today (yes, conventional agriculture louts like me listen to HPR, and not only do I listen to it I support it) about slave labor being used to grow vegetables in Mexico that are marketed in the U.S. of A! Congratulations people, for chasing American agriculture south of the border where anything goes! I really think that we have swung the pendulum too far back the other way. People can’t even tell what is right and wrong anymore. Scientists are evil for bioengineering and organics are all that is right and good in the world. If only people would take the time to educate themselves. Organic is becoming more and more like conventional agriculture. There are organically approved fertilizers, and organically approved pesticides. How is that any different than what we have learned from the Green Revolution? I have to say these days that my head is spinning! All I want to do now is look forward to retirement where I can grow my own food and shut out the world of incongruity and confusion that has become the standard of modern life and slip back into a quieter and gentler time. And oh, by the way, I will enjoy that seclusion by watching movies on my I-pad, typing email on my computer, calling friends on my smart phone, taking plane trips to the mainland, and driving cars in the countryside. You really have to wonder what people are thinking!